Microsoft WorldWide Telescope (WWT) requires Windows XP or Vista on a well-specced computer. Rather than go through the hassle of installing Windows via Boot Camp on my MacBook Pro, I ended up requisitioning my flatmate’s current model HP Vista laptop for the day, and was thus able to put WWT through its paces. The following is not meant as an instruction manual, but rather a discussion of WWT’s strengths and weaknesses, especially in comparison with Google Sky. From the menu top bar, you can observe objects in the sky by either exploring object collections, following a guided tour or by doing a search. Select a collection and you see a strip of thumbnails representing objects; click on one and WWT will navigate to it and smoothly zoom in. If instead you select a guided tour, WWT downloads a scripted tour of objects, often with screen overlays and a voiceover, that lets you sit back and let an expert show you around the sky. Search is “live”: Start typing the catalogue number of an object, like NGC4… and WWT already begins returning all NGC objects whose number component starts with 4. As you continue typing, the list of objects is whittled down. But if you search returns multiple objects, you can opt to plot them all. It leads to all sorts of serendipitous results. WWT also gives you integrated search on the SIMBAD astronomical database (Search > SIMBAD Search), which is like the Oxford English Dictionary of astronomical objects. Neither Google Sky nor WWT will find UGC 9350 for you via their normal search, but a SIMBAD search in WWT sends you directly there. That’s a boon for amateur astronomers. You can of course choose to browse the sky by dragging it around in the main window; the scroll button lets you to zoom in and out. Right click on the sky to bring up the “finder scope”, a floating window that tells you what you are looking at. Perhaps the coolest features are in the bottom strip. On the right is an essential tool for getting your bearings in the night sky — it gives you an idea of how far zoomed in you are, and of which part of the sky you are looking at. On the bottom left there is a dynamically created thumbnail collection of nearby interesting objects and alternate views of the current object in focus. This is an interesting and usdeful dynamic proximity-based navigation tool, and it makes exploring a region of the sky quite addictive. You can even access this dynamic list in the middle of a guided tour: I pressed pause on a slide showing NGC 2207 in a guided tour of colliding galaxies, browsed the galaxy in some alternate wavelengths using the dynamic thumbnail collection, then pressed play to continue the tour. Also on the bottom strip, you can choose from a long list of alternate base imagery datasets — from the default visible light to infrared, microwave, x-ray and much more. One feature that is bound to be of interest to amateur astronomers is that WWT lets you download source imagery for any part of the sky. 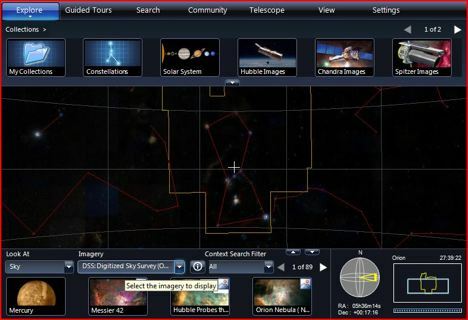 Sure, you can save a screenshot just like in Google Sky (View > Copy Current View to Clipboard) but you can also, for any object, right click on its thumbnail for a link to downloadable imagery from the Space Telescope’s Digitized Sky Survey. It’s a small detail, but one that makes printing out cheat sheets for star parties so much simpler. How does all this compare to the Google Sky component of Google Earth? WWT is a dedicated sky browser, and the advantages are apparent: There are no odd singularities at the poles, and the user interface is optimized for navigating the sky. The tour function lets professional astronomers impart their knowledge in an immersive and hence compelling way. WWT’s database contains a huge amount of selectable pre-made overlays of specific objects, often at many different wavelengths, making comparisons easy and intuitive. (Check out M104 for a great example.) The overall feel is one of remarkable smoothness and an efficient dissemination of a wealth of information. Still, WWT is not a complete slam-dunk when compared to Google Sky. WWT’s imagery downloads more slowly that Google Sky over the same bandwidth, so you have to wait longer for objects to become sharp. (Tours can take a really long time to download.) WWT only runs on Windows XP and Vista, so it can’t be a universal browser like Google Sky, which also runs on Mac and Linux. This is a pity, because one cool feature of WWT is the ability to generate a permalink to any object in its database (like the two examples above). Just right click on the object’s thumbnail, choose “Copy Shortcut”, and you can then link to it on the web. Unfortunately, you have to have WWT installed for this to work, and since many people cannot install WWT, it’s a feature that will not enjoy the same universal usability as a KML file pointing to the same place. KML support is another mark in Google Sky’s favor. The reason is not so much that KML is an emerging standard for sky object references (and an official standard for geospatial content). Rather, it’s that despite a lot of searching I found no way in WWT to create an overlay containing my own accurately positioned imagery, much like I did in Google Sky with KML to depict a recent gamma ray burst. WWT does let you create your own guided tours, which can then be shared or submitted to a community. But you can only add imagery to a guided tour as a screen overlay — not anything anchored to the sky. It is possible to open an accurately positioned image in WWT (Explore > Open > Image) but only if your image already contains Astronomy Visualization Metadata (AVM), whose functionality is similar to that of a GeoTIFF for Earth. If your image contains no AVM metadata (none of mine do), then there is no way of manually positioning it in the sky in WWT. The upshot is that despite my best efforts, I could not create a guided tour in WWT whose functionality was equivalent to the KML I had made of the gamma ray burst. Another way of putting this is that WWT provides tools for letting astronomy professionals present their knowledge to the masses — they will have access to AVM-savvy imagery and applications. Google Sky, just like Google Earth, is more geared towards letting the masses produce content for the masses, providing the tools to enable this. The above observations come with a caveat, of course: WWT is a beta, so perhaps future versions will indeed see KML support and tools for importing and positioning imagery into collections and guided tours. (Microsoft Research’s own MapCruncher would work wonders here.) And if WWT were to get KML support, perhaps Google Sky might reciprocate with support for shared WWT collections? One wish likely to remain unfulfilled is a version of WWT for Mac. Communities: WWT lets you join different communities from within the application, where you can download additional content or tours and eventually submit your own for inclusion. Both Astronomy Magazine and Sky & Telescope already have communities up, and they are busy adding tours. Virtual globes: In addition to showing datasets for the sky, WWT can also show you virtual globes. These additional capabilities are not a complete success. The Earth, rendered in 3D, is clad in Virtual Earth tiles, leading to a somewhat ironic situation: Whereas Google Earth is a dedicated Earth browsing application with a sky feature as an afterthought, WWT is a dedicated sky browsing application with an Earth feature as an afterthought. Many of the planets are also available rendered in 3D, but here I feel that the best application for viewing this type of content remains Celestia, which is dedicated to precisely this kind of visualization. (and Celestia is multiplatform.) One exception: The Mandelbrot Set on a globe Easter egg is extremely cool. Panoramas: You can view gigapixel panorama photos in WWT — some early examples are shots from the Mars rovers. These are gorgeous, but since these pictures are taken from a specific location on Mars, I think the best way of showing them will come when it is possible to embed gigapixel panoramas on the surface of a future virtual Mars globe, in a manner similar to how you can view georeferenced panoramas in Google Earth today. Nitpick: [Update: See comments for a solution] Finally, a small nitpick I hope a future version of WWT fixes: Different thumbnails of the same object displaying different positioned overlays of it often are linked to slightly different coordinates, so clicking between views leads WWT to pan and zoom, when really all I want it to do is switch between overlays of the same object to compare them. If I’m not making myself clear, you’ll see what I mean as soon as you’ve played a bit with WWT. To conclude, Microsoft WorldWide Telescope is an impressive piece of programming and a real pleasure to use. It’s fantastic to see such a capable new application added to the pantheon of great free educational software, though I do yearn for the day when all applications are built using multi-platform codebases. I hope WWT soon supports astronomical KML files, and that it becomes easier to add user generated content to an otherwise great touring function. I’ll be going back to my Mac now and Google Sky, which remains good enough to sate my astronomical urges, but I suspect I’ll borrow my flatmate’s Vista machine from time to time just to lose myself for a few hours in a serene and polished sky. I wouldn’t say that a Mac version is out of the question — the display technology here is presumably based on Deep Zoom which is an integral part of Silverlight 2.0, which will soon be fully cross platform (even Linux). Who knows what Microsoft is planning, but the styling of the UI seems very Silverlight to me. Glad to see you picked WWT up on the bandwidth problems. WWT does not work in Korea *at all* due to this. It’s not as if Microsoft don’t have the infrastructure so presumably that will be fixed before release. Stefan, I would contest that in NGC 182, the ‘detail’ is only relavent to the amount of data that can be accessibly interpreted/seen. If you notice, while the ‘rawness’ of NGC 182 in WWT is more ‘pure’ in respect to the original collect from the telescope — NGC 182 in GS presents us with more detail in overall bodies that exist in the image. Thus, this might be a debatable circumstance based solely on image-processing techniques and nothing more. I agree though that NGC 182 in WWT looks aesthetically ‘better’ due to its preservation of raw characteristics in detail. 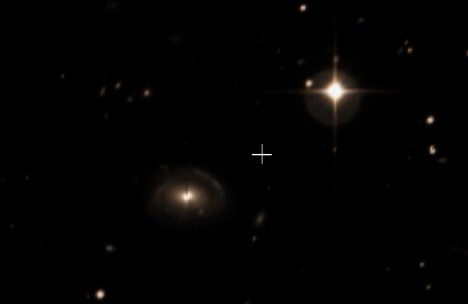 Just switch to SDSS layer in WWT and you see the same image as in GSky. m_k, thanks for the pointer, you are absolutely right. So what is going on here? The Sloane Digitial Sky Survey (SDSS) covers a little less than a quarter of the night sky. 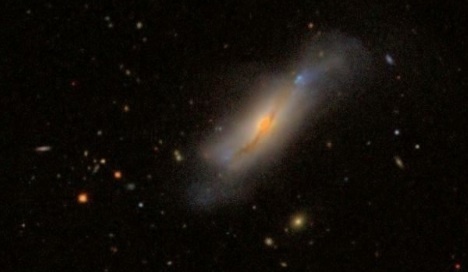 NGC5675 happens to be in that quarter. Whereas Google Sky consolidates all the visible light layers into one (with more detailed SDSS imagery taking precendence over the lower-quality DSS imagery), WWT keeps the two layers separate. WWT’s default layer just has the DSS imagery, but you can choose the SDSS layer in the bottom strip. If you choose the SDSS layer in WWT, you can compare its rendering to that of Google Sky. One thing is immediately notable: Google Sky downloads and shows you the detailed imagery much faster than WWT. Initially, I also thought that Google Sky rendered the same imagery in more detail for a given level of magnification, but this just turns out to be due to a default setting in WWT that you can change: Just change Image Quality to Sharper. It slows down the downloading and rendering even more, but you do get the same level of detail as Google Sky. On the “Nitpick”: If you click on the image icon in the top right corner of the thumbnail in the context search list below, the image switches without moving the view. It’s easy to miss if you don’t think to look for it, but I think that address your nitpick. Try it out! Jonathan: That’s a really great tip. Thanks! It really works and solves all my frustrations. 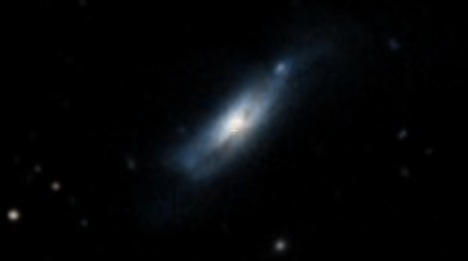 First, Google Sky covered DSS images over by SDSS and Hubble that I didn’t like at all! 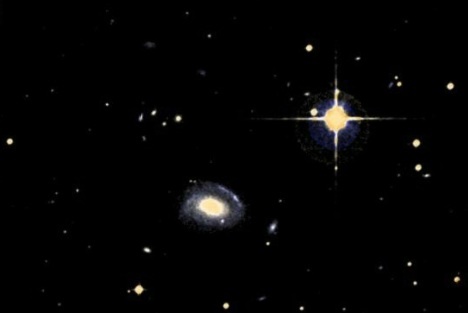 That’s why you get confused with NGC 5675 – WWT has absolutely the same view if you switch to SDSS layer. WWT, similar to WikiSky keeps DSS and SDSS as different layers. Both WWT and Google Sky significantly cutting off background on DSS along with faint objects. * Accurate presentation of planets and moons in real time. * Ability to move your viewing location, and see local horizon. * Move +/- 2000 years in time and see planet etc. in correct location. You can also speed, slow and reverse time. * The astronomical engine is accurate enough that you can reproduce eclipses, occultations and chance planet and moon alignments. Images from of solar system objects from a specific place and time match WWT predictions of them. * 50+ full sky surveys with most bands between Radio and Microwave represented. * You can cross fade between different bands and surveys to see the nature of objects. * See field of views for telescope/camera combinations from a entry level Meade or Celestron scope, to the Hubble Space Telescope. Are you not getting any images, just blackness? It seems the Radeon 9250 is the problem. Hopefully there will be a fix for this. The newest Driver for the video card is from Nov, 2006. Updating to that driver does not solve the problem. If I find a way to get it to work with my 9250, I’ll post it here. In case you’re still following the comments, yeah, I’m only getting blackness. I recently reinstalled Windows (the day before I installed WWT, actually), and have yet to install the latest drivers from ATI. I’ll do that soon and update as to what happens. Thanks for your support. :) But I’m definitely not expecting much.. Problems with this program with the radeon 9250 are universal. I have been following my blogs and forums and people with this card describe the same issues. The Tech help at WWT are no help at all. Hopefully they’ll do some work to make this card supported. Catalyst driver is the latest for this card. Should I wait a year or two for new version WWT? Good news for Astro+Mac-heads–a pretty darn great web-version release of WWT for *any* platform is now in early (alpha) release. It’s already available for download at worldwidetelescope.org. With no offense to Google, it’s really fantastic, especially at the poles & in terms of smooth zoom & pan. Also, the Tours all work, and a shift-click at any position gets users to Wikipedia, Journal articles, NVO searches for that position & more.